New evidence has emerged that suggests ancient surgeons in China were drilling or scraping holes in people’s heads more than 3,500 years ago. The process, known as trepanation, was used in various places worldwide in prehistoric through historic times. Researchers think it was done for medical and/or spiritual purposes. Smithsonian reports that archaeologists have found early evidence for trepanation in China. In particular, it refers to the mummified remains of a woman from the Xiaohe tomb, who had undergone a craniotomy. The remains had been excavated in 2005 after discovery in the 1930s. It dates to about 1615 BC and is in the Xingjiang Uygur region. “The extent of the tissue healing around this craniotomy site suggests that she lived at least one month after the craniotomy was done,” Emanuela Binello of Boston University School of Medicine told Smithsonian. She is a neurosurgeon and a senior author of an article in World Neurosurgery, which reviews scientific literature on trepanation. “From what we found, there is a good amount of archaeological evidence as well as literary evidence to support the fact that this was also done in ancient China, not just in other parts of the world. It’s really a global phenomenon. It was happening everywhere back then,” she told Smithsonian. “Archaeological evidence has dated the practice back much farther in places like ancient America and Africa, and a recent dig by a Polish archaeologist claimed to have found a 7,000-year-old case in Sudan,” says Smithsonian. In fact, evidence for trepanation has been found all the way back in the New Stone Age or Neolithic era. This practice of drilling or scraping holes in the head continued through the Middle Ages in Europe. More than 500 years ago, Dutch painter Hieronymus Bosch depicted several scenes of it in his works. According to a 14 th century historical novel ‘Romance of the Three Kingdoms’, Cao Cao, a Chinese warlord of the 3 rd century AD, is said to have received trepanation treatment following a bad headache he acquired from a dream in which he attacked a holy tree with his sword. He called on doctor Hua Tuo, now known as the founder of Chinese surgery, to treat it. Dr. Hua reportedly advised Cao Cao to get a hole drilled in his head. 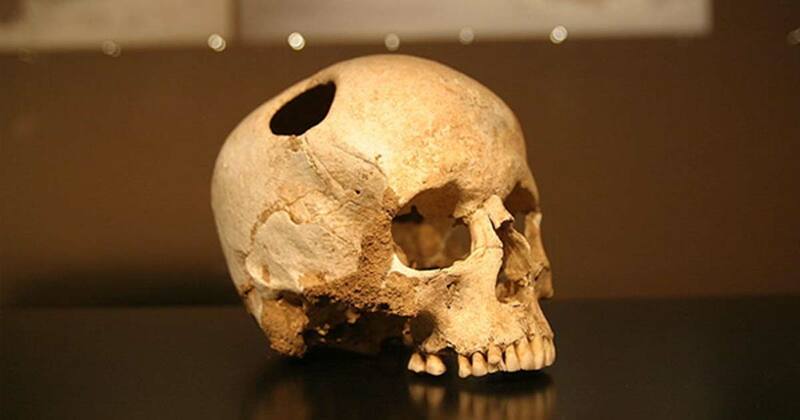 This is one of the earliest cases of Chinese trepanation in recorded history, though its accuracy has not yet been supported by archaeological evidence. There are numerous cases of ancient people surviving the delicate cranial surgery, as indicated by signs of healing around the edges of the holes in the skull. As Ancient Origins reported in 2015, Russian scientists examined ancient human skulls and tested bronze tools on a modern skull to see how doctors in Siberia more than 2,000 years ago performed brain surgery on three adults. It is still unknown what anesthetic, if any, was used to dull the pain during the surgery. The ancient doctor or doctors who performed the surgeries drilled the hole at a location on the skull that minimized damage to the brain and assured longer survival. Remarkably, it appears one of the men lived for years after the trepanation surgery. In 2012, archaeologists excavating burial caves in the south-central Andean province of Andahuaylas in Peru discovered the remains of 32 individuals dating back between 750 and 1000 years and, incredibly, they found evidence of 45 separate surgical procedures on the skulls of the individuals. The skulls found in Peru show evidence that sections of the cranium were removed using a hand drill or a scraping tool. Some of the remains showed evidence of their hair having been shaved and a herbal remedy placed over the wound, which all point to the fact that this was an attempt to heal sick or injured individuals. Archaeologists think most of these ancient operations were performed to treat individuals who had suffered massive head trauma, most likely in combat. Early surgeons probably performed trepanation to remove splinters of skull bone and relieve pressure from blood clots that formed when blood vessels were broken. Yet more inaccuracies and falsehoods spread by ancient origins to please Chinese donors and sponsers. THIS DOES NOT INDICATE THAT THE CHINESE CAME UPON SURGERY INDEPENDENTLY! THIS FINDING IS IN THE XINJIANG UIGHYUR REGION, WHICH WAS NOT OFFICIALLY PART OF THE HAN CORE AREAS OF WHERE THE ORIGINAL CHINESE CIVILIZATION STATES SPRANG UP! EVEN TO THIS DAY THE PEOPLE OF XINJIANG DO NOT CONSIDER THEMSELVES TO BE PART OF CHINA PROPER OR CHINESE CIVILIZATION AND WANT TO BREAK AWAY FROM CHINESE CIVILIZATION! MORE THEN 3,500 YEARS AGO, THIS PART OF THE WORLD WAS OCCUPIED BY WHITE INDO-EUROPEAN TYPE PEOPLES SUCH AS THE WUSUN, SAKA, ION, RONG, XIANBEI, XIONGNU, DI, TOCHARIANS/YEUZHI, YI ETC ETC TRIBES! WE HAVE THE TARIM MUMMIES AND OTHER RECENT EXCAVATION FINDS TO PROVE THIS! THIS PART OF THE WORLD WAS NOT CONSIDERED PART OF CHINA, THE CHINESE DIDN'T EVEN CONSIDER THIS PART OF THE WORLD TO BE PART OF CHINA BACK THEN! HOWEVER, THIS REGION ALONG WITH CENTRAL ASIA AND SIBERIA, HAS DEEP TIES AND LINKS TO INDIA AND INDIAN CIVILIZATION! THIS PART OF THE WORLD WAS ONE OF THE FIRST AREAS SETTLED BY INDIANS FOLLOWING THE DECLINE OF THE INDUS VALLEY CIV, AND THE SETTING UP OF THE BMAC CULTURE ZONE! INFACT SIBERIA AND CENTRAL ASIA IN OLD EUROPEAN MAPS WERE CONSIDERED PART OF INDIA PROPER! THE OLDEST SURGERY AND THE MOST REFINED IN THE ANCIENT WORLD WERE PERFORMED BY INDIANS FROM INDIA, WE HAVE TEXTS TO PROVE THIS!